When I decided that I wanted to learn how to play the guitar, I wasn't sure where to start –- so I turned, as I always do, to my trusty iPad. I'm not the most spontaneous person in the world – my wife and kids would say that is a huge understatement. I am a bit programmed and disciplined and really work on "trying new things." So, in my disciplined way, I decided that at 48 years of age, it was time for a mid-life crisis. Since I'm not terribly spontaneous, I have an amazing, beautiful wife and six great kids, my mid-life crisis needed to be something out of the norm. I thought about getting a motorcycle, but my family seems to think I lack the proper coordination and that it might end very badly for me if I tried that. Then it dawned on me – what I wanted to learn how to do was play the guitar. I have been playing the piano since I was about six, I knew music theory and I played in bands in high school; but what I really wanted to do was learn the guitar. I found my goal, and set upon my journey with iPad 2 in hand to start my adventure. The first thing I needed to do was buy a guitar. I fired up my eBay app to see if I could get a good used one. 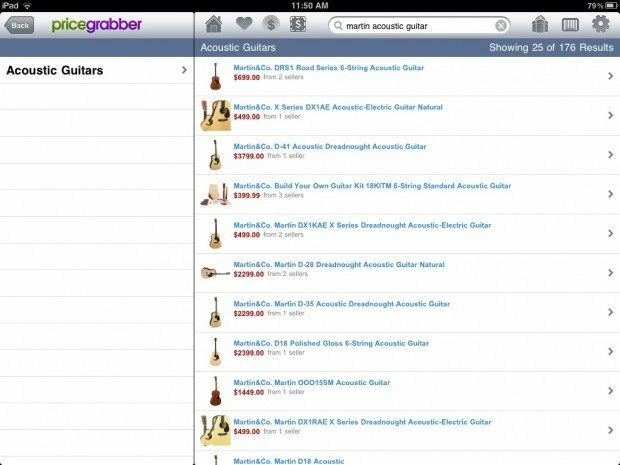 When nothing jumped out at me, I launched the PriceGrabber app and looked for a guitar that got a great write up in Guitarist Magazine that I had just read using iOS 5's Newsstand. I ordered my new guitar and started looking for apps to teach me how to use it. 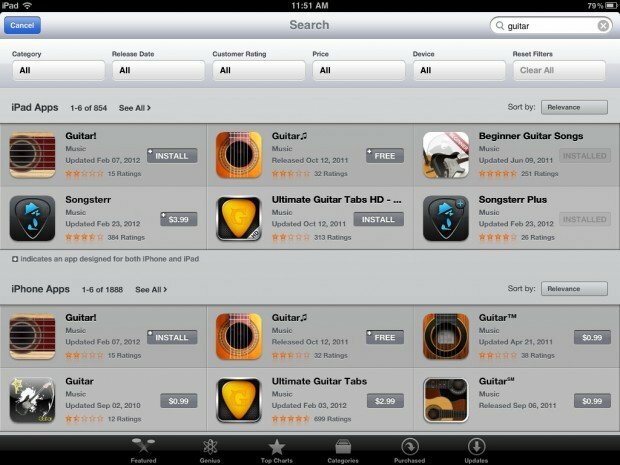 I was very surprised that when I did a search for "Guitar" in the App Store, I found over 800 iPad apps and close to 2000 iPhone apps. Where to start? I narrowed my search to "Beginner Guitar" to narrow the field a bit. Pay dirt! I found Beginner Guitar Songs from GuitarJamz.com. Marty Schwartz, who is an amazing guitar teacher, showed me how to hold the guitar, how to hold the pick, basic strumming patterns and then introduced easy chords to learn. 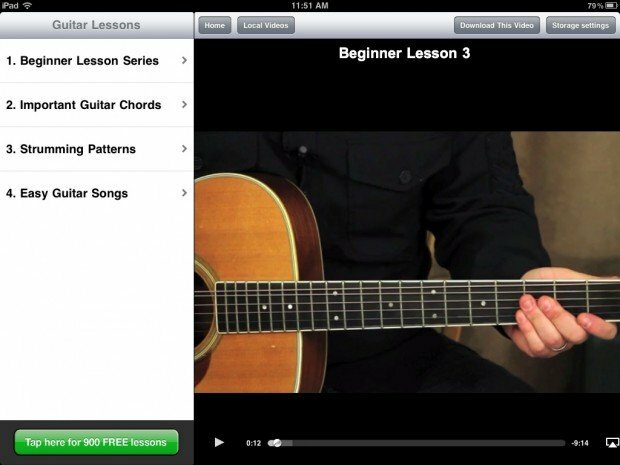 I quickly progressed through the Beginner Lesson Series and advanced to Important Guitar Chords. After an afternoon, I could play an E minor, A major, D major, G major, E major, A minor and C major chords –not bad for the first day. The next morning of my first weekend with a guitar, I fired up the Beginner Guitar app again and went through the Strumming Patterns and tried to learn some songs from the Easy Guitar Songs section. This was so much fun and I could really see some progress. One thing that Marty did mention in the lessons was keeping your guitar in tune. I had forgotten about that. I touched base with some musician friends and read up on line. It seems that the "purists" like to use a tuning fork, the "realists" like to use an analog chromatic tuner and the "techies" like the digital chromatic tuner. I just couldn't see dropping close to a hundred bucks on a tuner when I knew there must be "…an app for that." 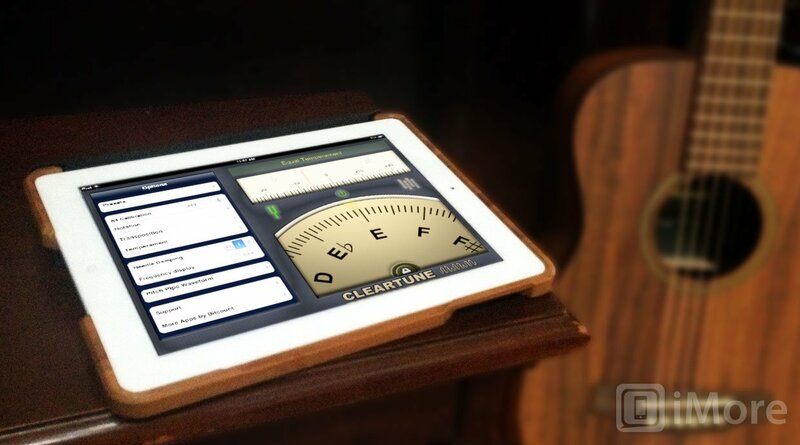 Back to the App Store – this time searching for Guitar Tuner. 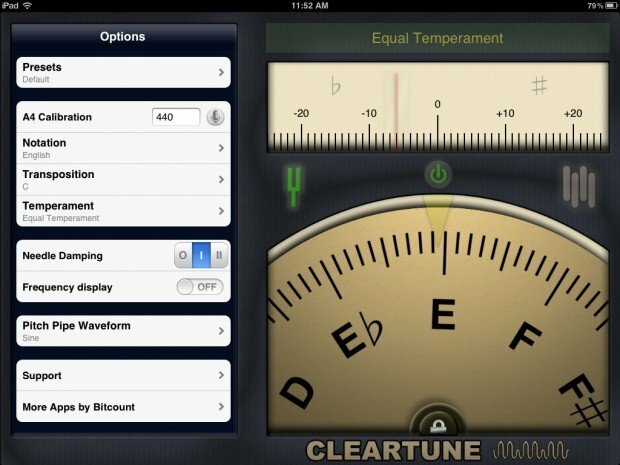 I came across many options, but I settled on Cleartune Chromatic Tuner. For $3.99, I figured it would be worth a shot and it is great. Play a note on the guitar and the "analog looking" dial shows you how far off from the actual note you are. I just tuned my strings and kept plucking and tuning until the guitar was in perfect tune. Now I was ready to learn more chords – I had about seven under my belt and I wanted more. I found the Howcast Guitar Lessons app and found over 140 video lessons – mostly chords and progressions. I spend the better part of the day learning more chords. I continued each day; adding a new chord and then reviewing the ones I had learned. By the end of the first week I had about 10 chords I was comfortable with. By the end of the second week, I had about fifteen I could remember and play. The Howcast app also taught me how to play scales and I learned the Pentatonic scales and the Blues scale and felt like I was ready to dive into some music. I so enjoyed the GuitarJamz app that I looked for more stuff from Marty Schwartz and found Blues Licks, Solo Guitar and 100 Lessons and I downloaded all those apps. I then saw that in addition to the apps and the website, Marty had hundreds of lessons for free on his YouTube channel. I watched, learned and experimented to see what I could do. I had to remember, I was only a little over two weeks into my new hobby. What I learned was that some of my favorite classic rock songs were pretty easy. America's "Horse With No Name" – two chords. The Beatles' "Let it Be" – four chords. Cat Stevens' "Peace Train" – four chords. I could do this. Over the next few weeks – and now after about four months – I have been watching YouTube videos, using the Chromatic Tuner app and downloading guitar sheet music via the Songsterr Plus app. 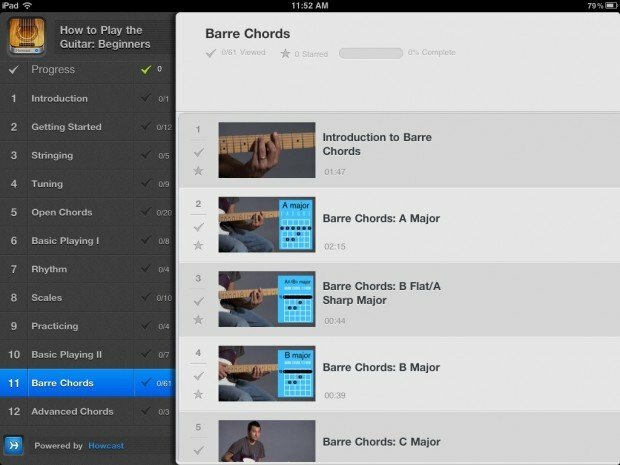 The guitar learning apps showed me how to read guitar tablature and chord diagrams – so I can do that as well. As I write this, I have just learned the guitar solo to Pink Floyd's "Wish You Were Here" – something I never envisioned I would be doing four months into learning how to play the guitar. Now, I still need lots of work and I'm sure my technique needs improving. Thanks to a Valentine's present for my first "in-person" guitar lesson, I hope to work on those things and more. 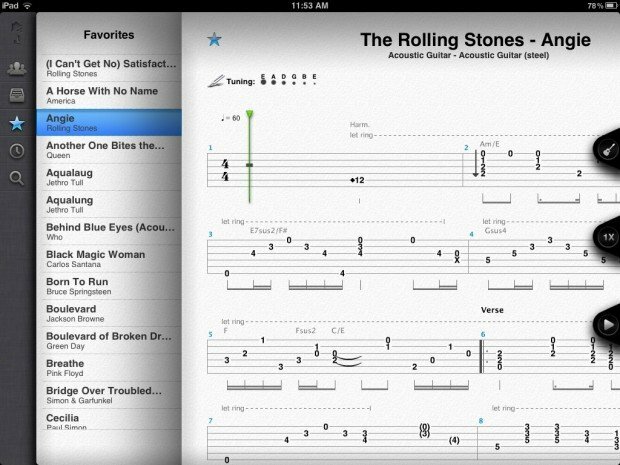 However, the reality is that I really did learn how to play the guitar using my iPad. Have you learned how to do something new using your iPad? Let us know by posting a comment below or joining this discussion thread in our forums.